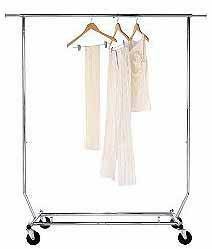 A temporary garment hanger that you can store when not in use can be very useful. This is a guide about collapsible garment hanger solutions. In a magazine I saw a picture of a garment hanger made of PVC pipe. Being disabled, I must sit to do my ironing, so this would be ideal to have next to the ironing board to hang the ironed clothes on rather than having to get up and down to hang them in the closet one at a time. Does anyone have a pattern or instructions for something like this? The one in the picture folded up for easy storage. Thank you so much. Here are a few plans pages, I don't see exactly what you want, but hopefully you will get some ideas. PVC is a joy to work with--think tinkertoys for grown-ups! It may be cheaper to buy one already made at Walmart. They usually have 2 to choose from, a lower cost one & a more heavy-duty one. My mom just bought one at Walmart last month for around $18. Some models have a height that's adjustable, which may come in handy for you. Some fold up & some don't. I bought both of mine garment racks at Second Hand stores. I like the ones with wheels & they can easily be removed. Here's a much nicer one that folds up, sold at Target for $44: This is the photo posted. * To find these, I Googled the words "low cost garment rack". I have had great luck just going in to Home Depot with a simple drawing & the sales people have told me exactly which PVC attachment pieces I need to buy & how much PVC pipe I need with directions.. If I were you, I would buy the metal pipe instead of the PVC because PVC tends to bend unless you buy the more expensive thicker PVC. Another Idea: Instead of using a round PVC pipe or closet dowel across the top, make one using a white wire closet shelve at Home Depot. They only cost $4.66 for a 4 foot section & they will cut these wire shelves to any length you need for free & only charge you for how many feet you buy (at about $1.20 per foot). Because if you use a wire closet shelf, you can hang your garments into the holes of the wire-shelves, but you will also have a place on top of the shelf where you can put your folded cloth. 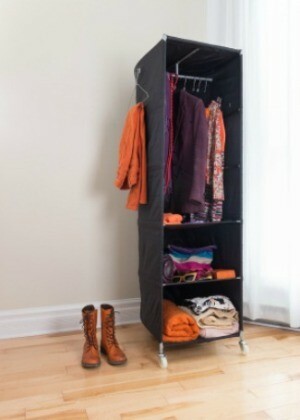 You could also just zip-tie a wire closet shelf to the base of the garment rack, like on the one below. Just measure the base, then have the folks at Home Depot cut the wire shelf to fit. Then simply zip-tie the shelf to the base on or use wire.